It may not be something that you think about when making an appointment at a new hair salon, however we have found that taking a little bit of time to properly prepare for your hair appointment can lead to better results. It is advisable for you to arrive to your salon 5 minutes before your appointment time as busy stylists will run a column with appointments booked back to back. All appointment times are structured to allow time for a thorough consultation, shampoo & conditioning ritual, your technical service and the end of service consultation. Should you arrive late, it can effect the timing your appointment and also the stylists other appointments for the rest of the day. 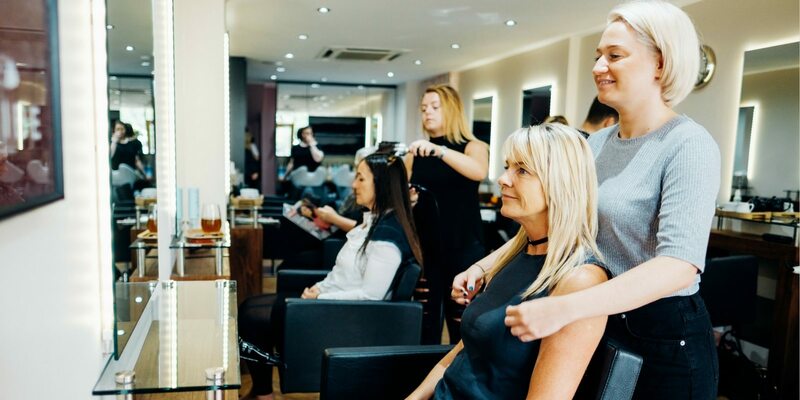 We want your experience in the salon to be as pleasant and relaxing as possible, so allow plenty of time for your journey and finding a parking space. You can park outside the salon for a maximum of 2 hours before you will have to buy another ticket. If your appointment or visit to the high street is likely to take longer than 2 hours, we advise that you park in the car park at the top of the high street where you can park your car for longer periods. We want your hair to be manageable and well suited to your every day lifestyle. However because visiting the salon is a relaxing experience usually taken on a day off, it means that you may come to the salon with your hair, make up and clothing totally different from how you usually look. This is particularly important for guests coming for a hair colour appointment who come to the salon without their usual make up as it can give your stylist totally the wrong impression and could lead to them to choosing a hair colour that doesn’t suit your usual style. Now, we’re not saying that you have to make an effort for us! But make sure that in your consultation that you discuss this with your stylist so that they can create the perfect style for your everyday needs. Sometimes many of our guests do not think about eating before coming to the salon, often forgetting the length of their appointment time. This could mean that you could go for hours without something to eat and the exposure to strange smells and products we use could result in feeling ill or becoming light headed. We don’t recommend visiting the salon on an empty stomach, but if you do, we can organise getting something to eat from somewhere in the high street. Ever heard this saying before? Well it’s very true when trying to describe a certain style and colour to a hairdressers. Well trained and experienced hairdressers are generally very good at interpreting descriptions of styles by guests, but as visual people it always helps to bring along pictures, images or even sketches to show examples of the style you desire. This will cut out the chance of miscommunication, confusion and will ensure your stylist knows exactly what you are trying to achieve. A common gripe people have when visiting a hairdresser is that their hair looks amazing when they’re finished at the salon, however they can never quite recreate the look at home. Explain to your stylist how much time you usually spend styling your hair and let them know about products & equipment that you use. When changing your style, be prepared that you may have to invest in the right tools and products to make it easier to recreate the salon look, at home. You may also have to learn a new technique for styling your hair and with any new skill, it may take time and practice before you get proficient enough to achieve the result. Sometimes your desired result may not be achievable with just one visit to the salon. However, if you discuss how you would like you hair to look eventually, your stylist can recommend a hair regime that will give you the best chance of achieving the look that you want. Our stylist can advise you on how often you will need to leave your hair in-between appointments, how to look after your hair at home and also how you can evolve your style through the seasons. If you’re having a colour service, make sure that you have completed a recent allergy test before your appointment. Failing to do this means we will not be able to apply colour to your hair. We also advise not to shampoo your hair on the same day of your colour service, the natural oils in your hair will give added protection to your scalp and skin when the colour is applied. Our stylists have created many amazing transformations over the years and their experience and knowledge means that they have some great ways of improving the relationship and experience you have with your hair. You know your own hair better than anyone. Help your stylist by telling them about the problems & struggles that you have with your hair allow them to find the right solution to help you solve them. Remember that beauty is in the eye of the beholder and hairdressers are people with their own individual tastes & preferences. Hairdressers are usually very good at matching the right style to the right person, however if you go into the salon without an idea of what you want, be prepared that your stylist may create something according to their own taste and perception of your style. If you want to let your stylist to be creative and do what they think is best, make sure that you make them aware your usual hair styling rituals and how much time you can spend on your hair each day. Most importantly, your experience when visiting the salon should be relaxing and fun. We work hard to create a balanced atmosphere in the salon and want you to enjoy every minute you spend with us.